Don’t ask me where I’m going to find the time or the money, but Italy is most definitely on my list for a trip or two next year. I just had a friend move to Naples last week, so perhaps I’ve found my reason (I’ll even call it ‘fate’, if I need to). 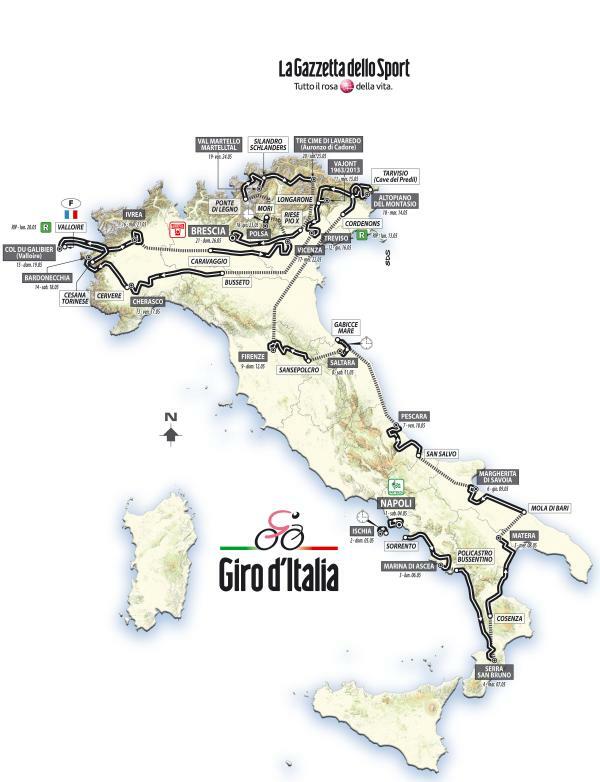 The Giro d’Italia route for 2013 is more balanced than this year’s summit-fest of climbing, with 89 km of time trials, but it still manages to have 7 mountain finishes! The Giro will stay in Italy most of the time next year, with just two days venturing over the border into France, with its first-ever summit finish on the Col du Galibier. Ryder Hesjedal will be back to defend his Maglia Rosa, but I’m not clear on who else is planning on racing. Contador was at the ceremony yesterday, but he said last year he’d never attempt the Giro-Tour double again. For Ryder’s sake, let’s hope he stays home. This entry was posted in Cycling and tagged 2013 Giro d'Italia route map, alberto contador, col du galibier, Ryder Hesjedal. Bookmark the permalink.